"Great! The unit worked perfectly for me and displayed the correct gear with little or no lag. It's nice to know at all times what gear you're in and this unit is one of those things that makes you wonder how you ever lived without it. " "I really love my new GiPro, it’s a modification I would not live without!" "I fitted one to my 1250 Bandit when I first got it, and it runs faultlessly. Yes, I know not everyone sees the point of them. I mainly got mine because the bike was new and very different from my last one. I also occasionally take a pillion, and when I do the bike handles totally diffently. Finding yourself in the wrong gear at junctions, etc can have less-than-good results. OK, most of the time you DO know what gear you're in - but there are occasions when you don't - especially with a new bike - and occasionally things happen where e.g. a forced fast down-shift leave you initially unsure. Put simply, I still consider it the best £100 I ever spent. 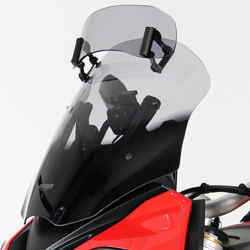 With a gear indicator I now spend more time thinking about the road, not the bike, and that has to be a good thing." "It is, without doubt, the best in class. 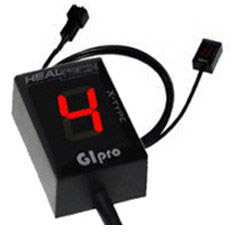 On two other bikes I had both an Acumen and a Datatool gear indicator but the GIpro beats them hands down! Finish is better by far and gear indication is instantaneous, to say I am pleased is an understatement." "Quite a doddle to fit and it works really well. Just as if Suzuki had fitted it. Well chuffed with it tonight when I went out. It really hellps to visually see what gear you are in. Saves cruising in 4th when you can easily go to 6th. Might even pay for itself eventually." "I have it on my 07 DL650. One of the best additions I've made. Simple plug and play. Very easy to install. 15 minutes and I didn't even remove the fairing!." 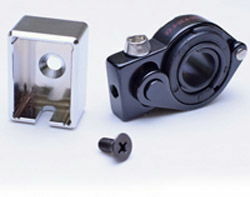 For all Suzukis without electrically driven speedos as standard (but which do have an electrically/electronically driven Tacho/Rev-counter) the GiPro Wheel Speed Sensor (WSS-Type) comes with a magnetic pickup convertor included to provide the electrical pulse required to activate your gear indicator. Please note the WSS units are universal and not model specific, but installation has been made as simple as possible. This combo unit includes a built-in Advanced Timing Retard Eliminator which improves acceleration and throttle response in lower gears and disables the speed limiter on 1000+ cc models. This feature can be turned on and off at the touch of a button to comply with local regulations. The Auto Brightness Controller ensures that display brightness is always optimal (the sensitivity level can be fine tuned if desired). !quote, electronics, bking, b king, vstrom, c109rt, c109t, gsf1250n, gsf1250na, gsf1250sa, gsxr600, naked, faired, gsxs1000, gsxs1000a, gsx-s1000a, gsxs1000f, gsxs1000fa, gsxr600, gsxr750, gsxr1000, v650n, sv650s, 600, 650, 1200, 600f, gsx-1300r, sv650s, sv650n, 1996, 1997, 1999, 1999, 2000, 2001, 2002, 2003, 2004, 2005, 2006, 2007, 2008, 2009, 2010, 2011, 2012, 2013, 2014, 2015, 2016, 2017, 2018, 2019, 2020, 96, 97, 98, 99, 00, 01, 02, 04, 05, 06 07, 08, 09, 10, 11, 12, 13, 14, 15, 16, 17, 18, 19, 20! Thankyou, top sellers, well recommended. Great item, fast delivery. Thanks!